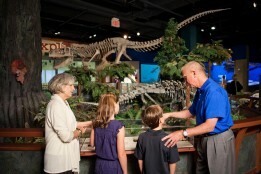 McWane Science Center is the perfect location for your family reunion. We offer multiple unique event spaces 7 days a week, four floors of interactive exhibits, an IMAX Dome Theater and a central downtown location. Our in-house catering and an experienced special events team is the one-stop-shop for a unique event styled exclusively for you and your family. Inside the museum, four floors of interactive exhibits celebrate science and wonder. The first step in planning your memorable family adventure is learning about the exhibits you will experience in the museum, click here to begin. McWane Center’s catering team, Elements of Taste, offers numerous menu options for your family get together. Our catering packages provide tables, linens and a private space for your family to socialize, eat and relax together. Below are samples of the menus we offer. Please contact our Special Events team for other options. Ball Park Picnic – includes a choice of salads, burgers, hot dogs, chicken fingers, baked beans, potato wedges, corn on the cob and desserts. Southern Delights – includes a choice of salads, fried chicken, beef brisket, BBQ ribs, mac & cheese, mashed potatoes, cheese grits, green beans, squash casserole and desserts. Back Yard Cookout – includes a choice of salads, grilled BBQ chicken, beef sirloin, pulled pork, baked potatoes, sweet potato fries, corn on the cob, green beans and desserts. We know you will find our event spaces, quality service and environment to be exactly what you and your reunion need in a space and an activity. Contact our Special Events team at 205.714.8363 or events@mcwane.org to book your reunion today! **Prices are subject to change. Please contact Special Events for recent updates.